Update, April 20: Shadow of the Tomb Raider is scheduled for a full reveal on April 27. Lara Croft’s third outing under the rebooted Tomb Raider brand is well on the way, and we already know it’s due for release on September 14. But we don’t know much beyond that, aside from the hints at a South American setting provided by the original teaser trailer. But all is scheduled to be revealed soon. Very soon, in fact. It looks as though Shadow of the Tomb Raider’s setting will be the Inca or Aztec civilizations. The Tomb Raider Twitter has posted a promise that “Shadow of the Tomb Raider will be revealed April 27th.” That’s one week from today, folks. We’d expected to be regaled with details at E3, but it seems Square Enix and Crystal Dynamics are bringing an early present for us. Experience Lara Croft’s defining moment as she becomes the Tomb Raider. Shadow of the Tomb Raider will be revealed April 27th. Exactly what form that reveal will take is as yet unclear. Keep an eye out as we approach next Friday. 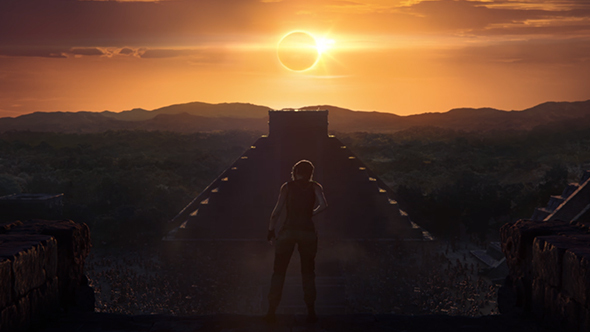 Original story, March 15:Shadow of the Tomb Raider has a new teaser trailer,confirming its September release dateand hinting at its setting. The game was officially announced this afternoon. There have been multiple Shadow of the Tomb Raider leaks in the past few days, as players were able to datamine the game’s marketing website to determine its release date. The teaser trailer also leaked, but is now confirmed to be live on the game’s new Steam store page, and in substantially better quality. It offers little more than some footage of Lara throwing herself through the jungle, before closing on a shot of our heroine standing in front of some Incan temples as the moon begins to eclipse the sun. You can see the full trailer above. The announcement, which was teased earlier this week, also confirms that the game will release on September 14. There’s little more to go on, but expect to see more at this year’s E3.